If nothing else, you can never accuse writer/director Guillermo Del Toro of approaching a project half-heartedly. The confirmed genre geek loves the monster movie fantasies that are his trade and commits fully to any flight of fancy that he gets to deliver on the big screen. Whether it be the art house historical horror fairy tale of Pan’s Labyrinth, the monster movie mayhem of Pacific Rim, or the comic book fantasy of Hellboy, Del Toro approaches his genre outing with care, love, and above all sincerity. Never has that been more apparent than in his latest feature Crimson Peak. It’s a full on Gothic Romance with all that implies. Equally luscious and lurid, the film offers thrills n’ chills alongside massive emotions and metaphors. Some will giggle at Del Toro’s sincere embracement of the melodrama of the genre, but those who give themselves over fully to his fantasy will find themselves enveloped in a stunningly realized vision unlike anything else on screens today. Mia Wasikowska stars as a fledgling gothic novelist and love-starved young woman. 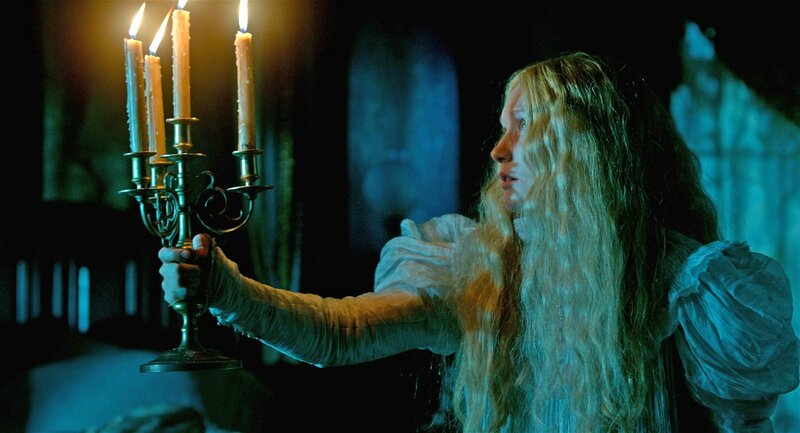 A prologue shows that the childhood death of her mother lead to a haunted warning to avoid a place a called Crimson Peak, but obviously that doesn’t work out. While doing her best to avoid love, gosh darn it Mia falls headfirst into it when she meets are particularly Tom Hiddleston-eque chap played by Tom Hiddleston. Sure, he’s got a sister (Jessica Chastain) who seems like trouble from across the room, but he teaches the young girl the ways of love. The untimely death of Wasikowska’s father thrusts her further into Hiddleston’s arms. Soon they are wed and she’s off to his creepy mansion in the middle of nowhere. The massive house is rotting and sinking with all the symbolic baggage that implies and Chastain only seems to become more threatening by the second. There’s also a pesky ghost haunting the halls at night, so things don’t seem all that swell for our young heroine, now do they. As is the Guillermo Del Toro way, Crimson Peak is a loveletter from the filmmaker to the Gothic Romance section of his massive nerdy collection. The film is written overtly as an entry in that genre, filled with so many layers of symbolism and foreshadowing that it can feel laughable to audiences unused to the tradition. He’s borrowing fully from the Bronte playbook, while also delivering more than mere metaphors with all the supernaturally tinged atmosphere. Absolutely every element of the film is heightened and meticulously designed by the filmmaker. Emotions are played big and broad with every one of them emphasized on screen through sets, lighting, and costumes that feel like a highlighter notes on the page of a worn out paperback. Some will find it silly, others sumptuous. The actors commit fully to the stylized playground that Del Toro provides. The costumes and his carefully arranged frames say everything we know about the characters emotional state silently and visually, yet the actors go big anyways (because in a movie like this, they may as well go home otherwise). Wasikowska does her usual waif-turned-strong heroine routine only on an even bigger scale than she did for time Burton, while Hiddleston proves that there’s no one better in the business at suggesting something sinister beneath charm and a smile. However, it’s Chastain who steals the movie. Even in profile she plays her dastardly character in broad strokes, yet clearly revels in the chance to depart so fully from her usual persona. She’s a full on movie monster and not even in a wolf-in-sheep’s-clothing way, more in a wolf-in-shark’s-clothing way. Beyond all the melodrama and gothic romanticism, this is of course a ghost story and a great one. Guillermo is a master of mood and gradually turns the screws before delivering full on horror. He uses foreboding sets, expressive color schemes, carefully controlled suspense, and fantastic character design to bath the audience in a sense of dread before delivering the big scares. It’s a mostly atmospheric creep out genre outing, but patient viewers will be rewarded by plenty of red stuff if that’s what they seek. 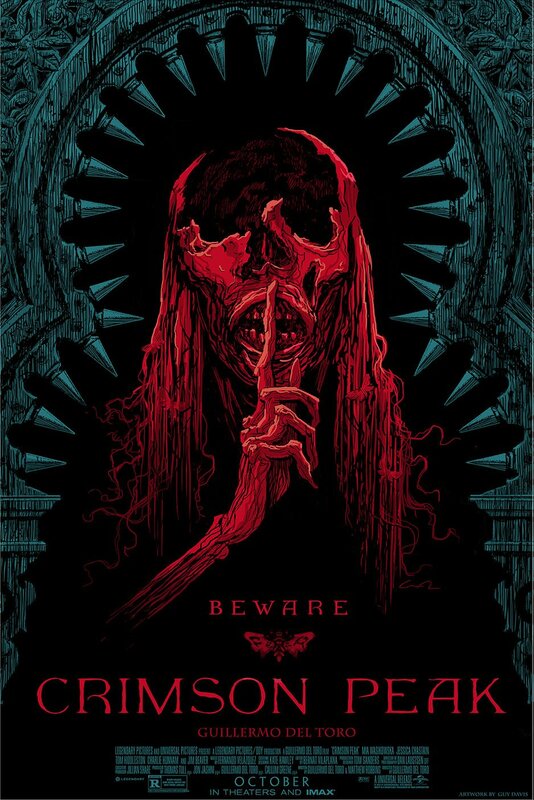 On a horror geek level, Crimson Peak is bursting at the seems with references and techniques pulled from a variety of titles like Black Sabbath, Deep Red, The Haunting, The Changeling, The Innocents, and countless others. His biggest directorial influence here is likely Mario Bava as he saturates the movie in garish colors and lurid lighting designs as beautiful as the are unsettling. It’s almost like a giallo twist on the classic Gothic Romance genre and that’s a pretty fascinating middle ground for horror hounds to find themselves within. 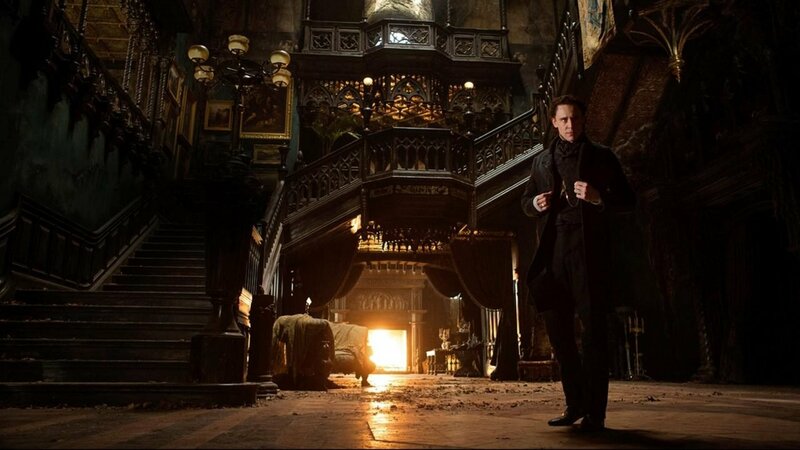 Crimson Peak is not Guillermo Del Toro’s finest movie as it’s neither as artistically ambitious as his most personal outings nor as colourfully crowd-pleasing as his most commercial efforts. However, the film does offer an intriguing combination of those two halves of the filmmaker’s career. It’s the closest thing that he’s come to delivering the art horror style of The Devil’s Backbone or Pan Labyrinth on a Hollywood scale and a intriguingly thoughtful stab at mainstream horror. It’ll be interesting to see how Halloween audiences respond to the movie, given that it’s such a lusciously romantic tale that slowly descends into horror. There will likely be giggles in the crowd at Del Toro’s most unapologetically melodramatic moments, yet it’s also impossible to imagine viewers not being creeped out and impressed by the astounding craftsmanship. 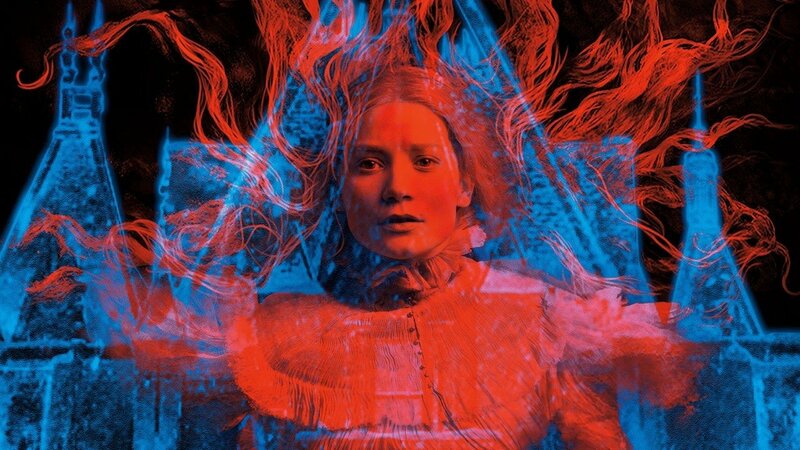 There aren’t many viewers out there like Del Toro whose love of grandiose literary metaphor and romance is matched by a love of gore horror, but those on that specific wavelength will be intoxicated by Crimson Peak. Everyone should still find at least something to love. The film is far too lovingly constructed and beautifully made for outright dismissal, even if the flaws are right on the surface alongside the triumphs. Absolutely every element of the film is heightened and meticulously designed by Del Toro.